Given that Paris is the location for what is (arguably) the world’s first detective story I thought France would be a suitable topic for this week’s contribution to the Crime Fiction Alphabet. I’ve chosen a mixture of books by French natives as well as books set in France written by ‘outsiders’. Edgar Allan Poe‘s short story The Murders in the Rue Morgue was first published in a magazine in 1841. Set in Paris it depicts C. Auguste Dupin as a detective who solves the murder of Madame L’Espanaye and her daughter in the fourth floor locked room of an apartment building on the fictional street of the story’s title. Several of the conventions which later became the norm for crime fiction, including the use of the detective’s friend as the story’s narrator and the use of deductive reasoning to resolve the mystery, debut in this story. John Dickson Carr was another prolific American author who used France as the setting for some of his crime fiction. The first of his novels to do so was 1930’s It Walks By Night featuring Henri Bencolin, a judge d’instruction (or examining magistrate) as the protagonist. After watching both entrances for some time police raid a Parisian gambling den and find a head severed from the kneeling body of a man. There are no secret passages to explain how the murder took place while the police looked on. M. Bencolin went on to feature in 4 more of Carr’s novels. Georges Simenon was Belgian but set his most popular series of stories, 75 novels and 28 short stories featuring Commissaire Jules Maigret, in France. Maigret was a pipe smoking, cider drinking, coat wearing police detective relying on a mixture of intuition and method to solve all manner of crimes. His last appearance was in 1972’s Maigret and Monsieur Charles which opens with Maigret refusing a promotion because it would stop him being ‘hands-on’. Instead he investigates the disappearance of a wealthy Parisian lawyer who has a secret life involving call girls (who know him as Monsieur Charles) and associated seediness. 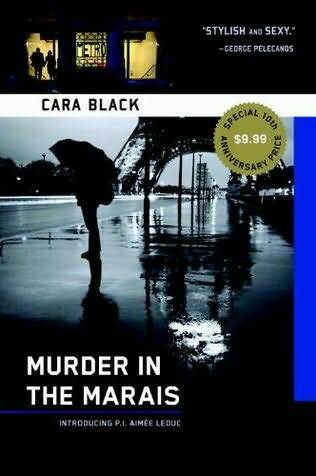 Cara Black‘s series of novels featuring Aimée Leduc, a French/American private detective who specialises in corporate security, runs to 11 novels with this year’s release. The first of these was 1999’s Murder in the Marais in which Aimée is asked by a rabbi to decode an encrypted photograph from the 1940’s but when she goes to deliver it as requested she finds the body of an elderly Jewish woman. A tale of neo-Nazis, war-time collaborators and modern immigration disputes follows as Aimée and her business partner, the only dwarf in crime fiction (? ), pull off several super-human feats of deduction and crime solving. Tonino Benacquista is a French novelist and screenwriter whose crime fiction books have been translated into English. 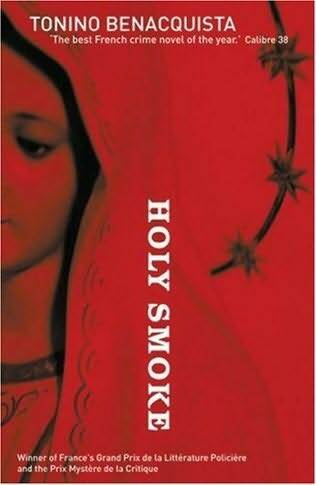 Holy Smoke is the first of several novels to feature Antoine Andrieux, a young Basque in Paris who works as a handler in an art gallery by day and plays billiards by night. The publisher’s blurb gives this synopsis “Some favors simply cannot be refused. Tonio agrees to write a love letter for Dario, a low-rent Paris gigolo. When Dario is murdered, a single bullet to the head, Tonio finds he has been left a small vineyard near Naples. The wine is undrinkable, but an elaborate scam has been set up. The smell of easy money attracts the unwanted attentions of the Mafia and the Vatican and the unbridled hatred of the locals. Mafiosi aren’t choir boys, and monsignors can be very much like Mafiosi.” Badfellas is a standalone novel by Benacquista that tells the story of an American gangster who moves to a small town in France as part of the witness protection program and was shortlisted for the 2010 CWA International Dagger Award. A book that I have on my TBR and plan to read for this year’s Global Challenge is Xavier-Marie Bonnot’s The First Fingerprint. The blurb for the book says it “…introduces a policeman as polished as he is brutal, as charming as he is streetwise and as deceptively noble as he is coarse. Michel de Palma, called “the Baron” by his colleagues, knows the dark underside of the city of Marseille as do none of his rivals. But his enemies are everywhere: in the crime-infested sinks of the suburbs; in the sleek and squalid bars of the old quarter; even in the police ranks themselves. When Marseille is thrown into turmoil by a series of savage murders, each signed with a print of a three-fingered hand, the Baron is ordered to drop his present investigation into the puzzling death of historian Christine Autran. But the Baron ignores his instructions, for unbeknown to his colleagues he has discovered a bizarre connection between the two cases. Autran was researching Le Guen’s Cave, an underwater cavern containing some of the earliest engravings known to man – including a crude drawing of a three-fingered hand. De Palma heads to the university in Aix-en-Provence to investigate further, but the clique of pre-history professors he encounters are as hard to unravel as the meaning of the cave-drawing itself. As he gets closer to the truth, the group of academics closes ranks. Deliberately and alone, de Palma begins pursuing a mystery that dates back to the Ice Age.” This is the first book in a planned quartet. 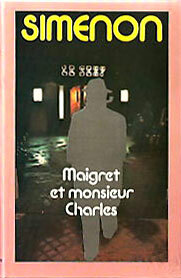 Jean-Patrick Machette’s thriller Three to Kill was originally published in 1975 but only translated into English in 2002 (seven years after the author’s death). It tells the tale of an ordinary businessman who purely by chance witnesses a murder which puts him in the path of two hired hit men and he goes on the run. While it might sound like a tired old ‘average man in peril’ scenario it is a cut above the usual fodder in that crowded space. It’s lean, dark and full of the author’s left-leaning social commentary (which does occasionally get a bit tiresome but is largely forgivable due to the insight offered into French life). This one really is worth getting hold of if you can unearth a copy. Dominque Manotti has written police procedurals and thrillers set in her native France. The only one I have read is Affairs of State which is a novel about the corrupting influence of power on…well…pretty much everyone. I thought the book lacked suspense (after a few pages it was pretty clear it would all end in tears) but the political insights and writing were top notch. I have another of Manotti’s books on order from the library. 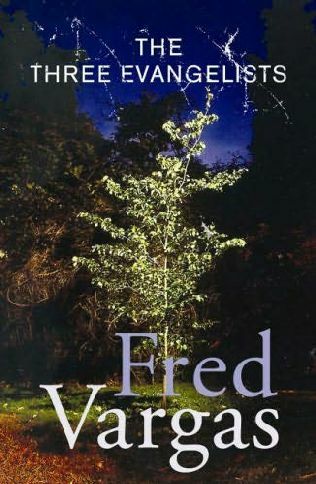 Fred Vargas is probably one of the best known French crime writers because she has been so successful in winning awards. She has a series of procedurals featuring a peculiar police investigator but my favourite of her novels is a standalone called The Three Evangelists. In it an opera singer becomes obsessed by a tree planted in her garden without her knowledge and she turns to her neighbours, three young historians and a disgraced policeman, to discover how the tree came to be planted and what it means. The book is a little surreal at times but an absolute delight to read. 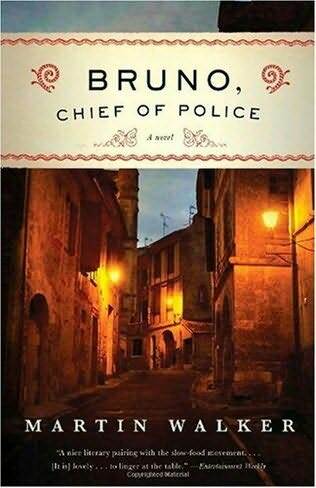 A French book I have yet to read but which was discussed by Maxine at Petrona last year is Bruno, Chief of Police by Martin Walker (who is not French but lives there and has done for many years). Publisher’s Weekly had this to say about the book “Policing in Chief Bruno Courrèges’s sun-dappled patch of Périgord involves protecting local fromages from E.U. hygiene inspectors, orchestrating village parades and enjoying the obligatory leisurely lunch—that is, until the brutal murder of an elderly Algerian immigrant instantly jolts Walker’s second novel (after The Caves of Périgord) from provincial cozy to timely whodunit. As a high-powered team of investigators, including a criminally attractive female inspector, invade sleepy St. Denis to forestall any anti-Arab violence, the amiable Bruno must begin regarding his neighbors—or should we say potential suspects—in a rather different light.” I’ve yet to get my hands on it but I will. Soon. Quinn Fawcett‘s Death Wears a Crown is the second of two books to feature Madame Victoire Vernet who is the wife of the head of the military gendarmes in the Napoleonic era. In this novel she is called upon to foil a plot to assassinate Napoleon just as he is to be crowned Emperor. Claude Izner is the pseudonym for two French sisters who have published a series of light historical mysteries set in and around Paris in the late 19th Century. Their hero is, like them, a book seller on the banks of the Seinne who gets into a series of scrapes. 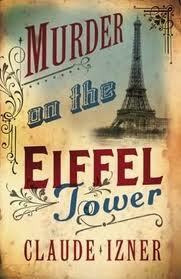 His first outing is in Murder on the Eifel Tower and he becomes involved in the investigation of a death at the opening of the iconic structure. This year sees the release of the 6th novel in this series. 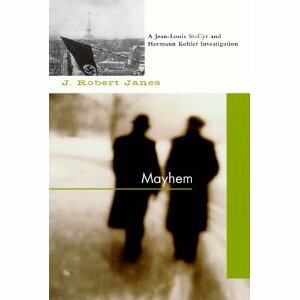 Among the many (many) standalones and series set during or just after the Second World War in France my favourite is probably J Robert Janes’ series of 12 novels set in the 1940’s featuring one detective on each side of the conflict. In the first book, 1992’s Mayhem, Jean-Louis St Cyr of the Sureté and Herman Kohler of the Gestapo investigate the discovery of a body near the Fontainbleu forest. Assuming the crime is resistance related the Nazi authorities want Herman to ‘solve’ it quickly with the ‘right’ result but the two detectives persevere with a proper investigation and discover that even in wartime family secrets and other mundane matters can be just as responsible for criminal acts as the armed conflict. I know there are plenty more crime fiction tales set in France so please do tell me your favourites. This entry was posted in Cara Black, Crime Fiction Alphabet, Dominique Manotti, Edgar Allan Poe, France, Fred Vargas, Georges Simenon, J Robert Jane, Jean-Patrick Machette, John Dickson Carr, list, Martin Walker, Quinn Fawcett, Tonino Benacqusita, Xavier-Marie Bonnot. Bookmark the permalink. Lovely lot of books to choose from there! Great post, Bernadette, you have covered all the French-set crime fiction books I’ve read (I think?) and several I haven’t. I have read another one of Manotti’s, Rough Trade, and it is totally different from Affairs of State. I don’t think that one is typical of her. http://www.eurocrime.co.uk/reviews/Rough_Trade.html . I also have to admit that I could not finish the next couple of Martin Walker books after the first- Bruno was a book I enjoyed a lot but like some other of the more whimsical authors, one visit is sufficient for me. I read A Jew Must Die by Jacques Chessex, which is written in French, but I think the author may be Swiss French so I don’t know if this counts? What a great post! 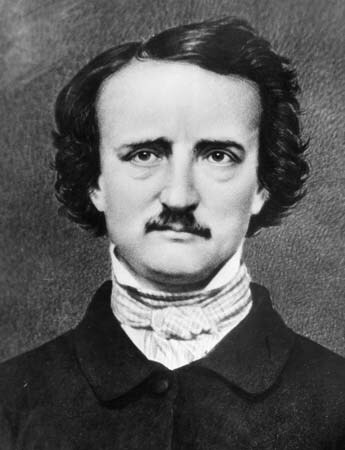 Poe, yes, first locked-room mystery, I believe…great story. Cara Black’s books are adventurous and interesting, giving a flavor of different parts of Paris, with a courageous heroine. John Dickson Carr, famous for his locked-room mysteries, which my dad and his family loved, and I have yet to tackle. Fred Vargas is one of my favorite authors–have read all of Inspector Adamsberg books, which are out in English. And, I, too, love The Three Evangelists–loan it out all over to friends, a plus of a paper back. I will go anywhere to follow Vargas’ brilliant thinking and convoluted plots. No one else goes where she does. Simenon I plan to read soon, just put some dvd’s on hold at the library which feature his inspector Maigret. And want to read Manotti’s books. And never heard of Machette, will write him down. Apart from Simenon, I have not read any of these yet, but Martin Walker and Fred Vargas are on that TBR. Loys of interesting possibilities there!. The Izner is in my TBR, plus the first of Jean-francois Parot’s historical mysteries, and I’ve had my eye on Martin Walker at the library. There’s also Pierre Magnan, who wrote “Death in the Truffle Wood,” and other mysteries. Brilliant post, Bernadette. Great choice for the letter F. Imaginative and informative. Needless to say, I love Maigret’s books. Only discovered them a few years ago so I was late to the table. Henri Bencolin. Loved him in SKULL ISLAND – read this again recently and reviewed it for the Vintage Mystery Challenge. I have a Robert Janes book on my shelves, but for one reason or another, it’s not been read. I will move it closer to the top of TBR pile now that you’ve reminded me of the author. I love, loved, LOVED the BRUNO, CHIEF OF POLICE debut. Can’t wait to read the next. I am charmed by this character and his little village. I’ve never heard of Fred Vargas. The books sound intriguing. THE BODY IN THE BELFRY is my favorite book in the Faith Fairchild series by Katherine Hall Page. It takes place in Paris and is a delight from beginning to end. Wonderful list. Attached is a list I have compiled of over 195 authors either setting their books in France or are European French speaking/writing. 17. Pierre Byard fr, Who Killed roger Ackroyd? 124. Eric Leclere fr, The Lost Son, A Place of Gardens and Lilies, What if they Like It? 188. Pierre Véry fr, In What Strange Land?